Do you enjoy preparing food in your kitchen and wouldn’t mind owning a tablet that can help transform the process of at home cooking, along with gaining content from leading chefs? Well, if you are in the USA, French firm UNOWHY has now announced the launch of the QOOQ tablet, which is the first interactive touch screen slate especially designed for the Kitchen. Made in France and already a big hit in the country with foodies, the QOOQ tablet helps simplify preparing meals for culinary novices and experts alike by offering in excess of 4,000 exclusive recipes from over a hundred of the most acclaimed chefs in Europe. The QOOQ slate runs on the Linux/QT operating system sporting a 10.1-inch touch screen, along with a 1GHz dual core processor, 8GB of internal memory and 802.11b/g/n WiFi, whilst being resistant to heat, humidity, splashes and all culinary mishaps. The tablet delivers interactive step-by-step guides to make delicious meals, deserts, and appetisers via real time HD video, texts and photos, and designed to be non-slip. The recipes on the QOOQ are listed via prep time, difficulty level, ingredients and cuisine type enabling the user to customise their cooking experience. The QOOQ tablet also offers personalised features that enable the user to input their own recipes, along with creating shopping lists and weekly menus, auto-adjust ingredient quantities, as well as sharing all with friends via Facebook and Twitter. 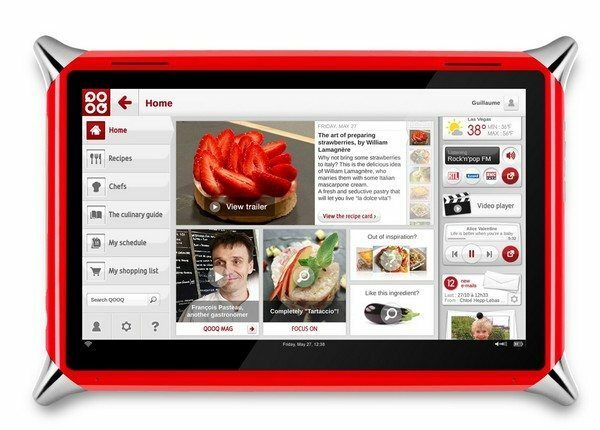 The QOOQ tablet has been available in the United Kingdom for a while now with a price of Â£289, and now you can purchase the culinary slate in red, in the United States for $399 from the QOOQ website.